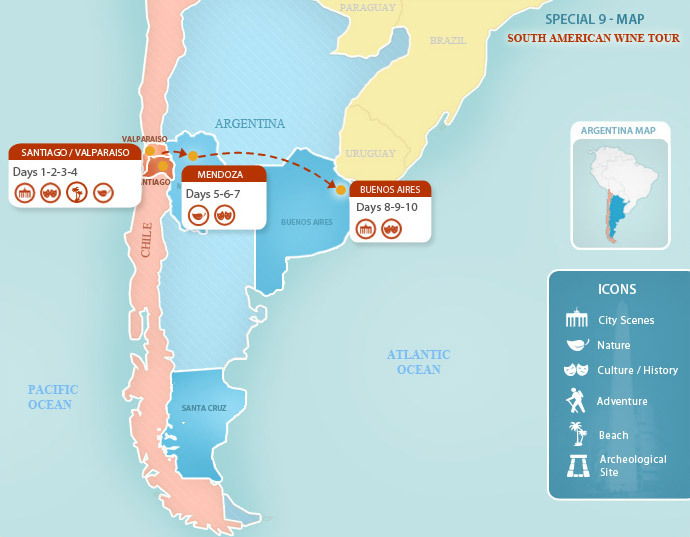 Whether you’re a wine connoisseur or merely enjoy warm climates and beautiful vineyards, this tour across Argentina and Chile will appeal to all your senses. You will get to explore two of the South America’s most interesting capitals and also taste flavorful and internationally acclaimed wines in the countryside. This Argentina package starts in lively Santiago, Chile, where you’ll get your first taste of what life in a South American capital is like. Once you’ve had your fill of the exciting city scenes, you’ll head to the Maipo Valley, where some of the country’s best wines are produced. Hop the border and travel to Argentina’s wine capital, Mendoza. Here you will have a chance to taste world famous wines and explore the natural scenery and diverse terrain before completing your Argentina vacation in cosmopolitan Buenos Aires, the country’s enthralling capital. The attractive locals, world class shopping, wild nightlife, and gourmet cuisine may seduce you into staying forever. Buenos Aires is a cosmopolitan metropolis with old-world languor and modern flavor. You will be met at the Santiago Airport by a Chile For Less representative and transferred to your comfortable hotel. Today, you will head out on a half day historical tour of Santiago to visit some of the most interesting sites in Santiago and learn about the fascinating history of Chile and its capital. You will start the tour driving up the Santa Lucia hill where Santiago was founded. You will then continue on to the historic downtown, Plaza de Armas (Main Square), where stands some of Santiago’s historic buildings. You will see the Cathedral, City Hall, Central Post Office, and National Historical Museum. You will then drive to the civic area to see the Moneda Presidential Palace, current seat of the Chilean government. The tour will continue through charming streets lined with 19th century buildings, passing the statue of Typical Zone, the Cousiño Palace, and the Basilica de los Sacramentinos (inspired by the Montmartre church in Paris). The tour will end on the Alameda Bernardo O’Higgins, Santiago’s main avenue where you will visit the San Francisco church and its beautiful colonial museum and monastery. The tour ends with your first introduction to Chilean wines. You will take part in a wine & cheese tasting in Santiago. You will have the remainder of the afternoon and evening to explore Santiago at your leisure. Today you will depart from Santiago to the Maipo Valley, the oldest and most traditional wine region of Chile. During the half-day tour you will visit one of several well-known vineyards, Concha y Toro, Cousiño Macul or Undurraga and take part in a wine tasting. Concha y Toro, Chile’s largest wine producer, has vineyards throughout Chile, but the original vineyards and owner’s quarters in Pirque are a must see. Viña Cousiño Macul is probably the closest vineyard to Santiago center, but you would not know it by setting foot in its beautiful park-like grounds. Don Francisco Undurraga, an enterprising man in the 19th century, was one of the pioneers of winemaking in Chile and founder of Viña Undurraga. Located in Talagante, 34 kilometers from Santiago, in the heart of the Maipo Valley, this vineyard began producing Cabernet Sauvignon, Sauvignon Blanc, Merlot, Pinot Noir, Riesling, and Gewürztraminer in 1885 and by 1903, the first shipments were being made to the USA. Note: Visits to wineries are subject to change, always maintaining the highest level of service possible. Today you’ll journey to Mendoza, Argentina’s famous wine capital. You will start with a transfer from your hotel to the bus station, followed by a bus ride across the Andes to Mendoza. Upon arrival you will be met at the bus station by an Argentina For Less representative and taken to your Mendoza hotel. You will have the rest of the day to explore Mendoza on your own or relax at your hotel. Today you will enjoy an excursion through the most representative vineyards around Mendoza, with views of lush agricultural and grape-growing areas. Afterwards, you will visit 2 local vineyards and have the opportunity to taste some of the delicious products. Your expert oenologist guides will instruct you on proper wine tasting and etiquette, as well as on the fascinating wine-making techniques. Enjoy lunch at one of the local vineyards in this magnificent Argentinean traditional country-side landscape. When you’re done tasting the vineyards’ delights, you’ll return to your Mendoza hotel to spend the evening at your leisure. Transfer from your hotel to the airport and flight from Mendoza to Buenos Aires. Upon arrival, an Argentina For Less representative will meet you in Buenos Aires and take you to your confirmed hotel. Enjoy the rest of the day at your leisure in the capital of Argentina. Read our Buenos Aires Travel Guide for ideas on what to see, where to eat, and what to do during your Buenos Aires vacation. Prepare for an exciting half-day Buenos Aires tour of the city’s highlights. You will start your tour in the city center, on the beautiful Plaza de Mayo surrounded by the Casa Rosada (Government House), the Metropolitan Cathedral, and the splendid Cabildo, which served as City Hall under the Spanish colonial rule. You will then continue on to Puerto Madero, Buenos Aires’ modern, financial district, where you’ll learn about the fascinating transformation of this lively neighborhood. Your next stop is La Boca where the Bombanera soccer stadium and the large population of Italian descent showcase Argentina’s passion for soccer. In the evening, discover the sensual tango dance at one of the most exclusive Buenos Aires tango houses, Tango Porteño. You’ll enjoy a delicious gourmet dinner while musicians and professional tango dancers perform before you. Tango shows in Buenos Aires can be compared to broadway shows, with a live orchestra accompanied by professional tango dancers. Meet your transfer to the airport for your flight home or on to you next destination. Opened in the spring of 2004, the Hotel Argentino offers a refreshing combination of elegance and affordability. Overlooking the Plaza de la Independencia, the hotel features a pleasant and delicious restaurant, a cozy bar, an outdoor pool, laundry service, room service, and massage services. The Los Girasoles Bistro has a tasty breakfast, lunch, dinner, and afternoon tea. The hotel's 46 rooms all include mini fridge, safe deposit boxes, cable TV, sommier beds, wireless internet, and direct access to national and international calls. The excellent amenities and friendly service will flawlessly compliment your exciting Mendoza tours and adventures. Located just moments from Galerias Pacifico and Florida Street, El Esplendor holds up to its name and is truly splendid. The grand exterior and its warm lighting invite you to the stylish lobby featuring modern décor, ambient lighting and stylish artwork. There are very spacious and well-furnished en-suite bedrooms, some with balconies overlooking the streets of Buenos Aires. The professional staff is very helpful and friendly adding to the superior service offered by the hotel. The stylish décor of the Tribeca Buenos Aires matches the timeless flair of Buenos Aires itself, with an attractive central courtyard providing a calming sanctuary in the heart of this thriving and exhilarating city. The spacious rooms are comfortably furnished and boast a stylish contemporary design with polished wooden floors and long linen window drapes that evoke a Spartan elegance. Meanwhile an excellent restaurant awaits, or if you prefer, your in-suite kitchenette offers you additional dining flexibility. The hotel's excellent location in Buenos Aires' city centre gives easy access to the city's world renowned cuisine and nightlife.